The original. This belt is simple yet versatile, and won’t leave any scratches on the back of your stringed instruments. Made to last from quality leather, and handcrafted with pride in America. Available in black and brown. Order yours today! 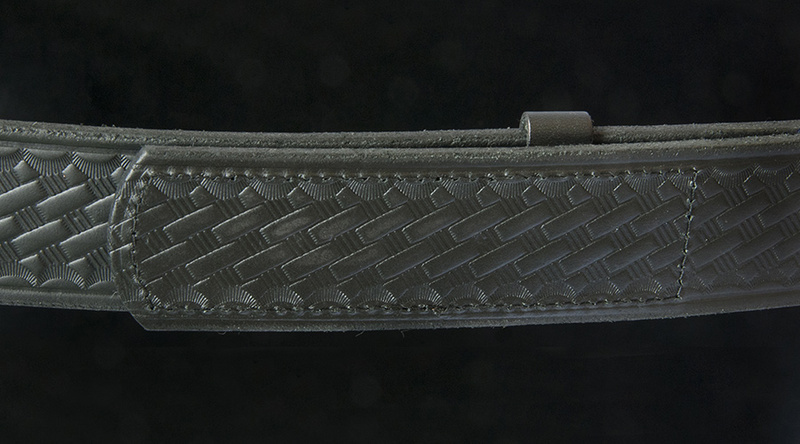 This stylish belt comes in black and brown, and sports a cool weave pattern. It’s both unique and familiar, and will give you the perfect snug fit every time. Handmade in the USA, with a limited lifetime warranty. You will love this quality belt. 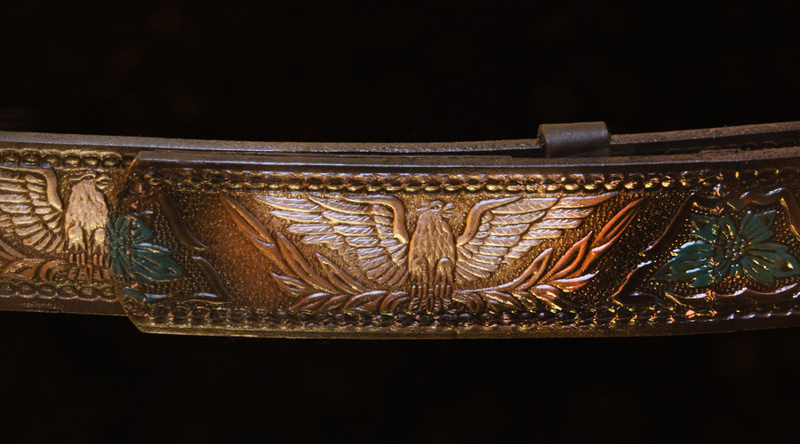 Nothing says rock-n-roll like this vintage eagle designed belt. It’s classically stylish, and made from genuine leather in the USA. The details of this belt is sure to turn heads while providing a snug, comfortable fit every time. 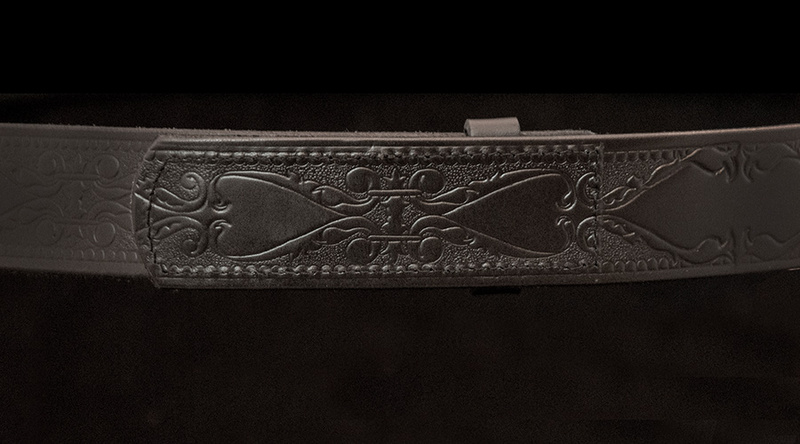 This eye-catching belt has a rustic but elegant feel with an ornate scroll pattern. It’s reliable, ready for the stage, and will leave your instruments free of any scratches. Made by hand from durable leather in America, and currently in stock. 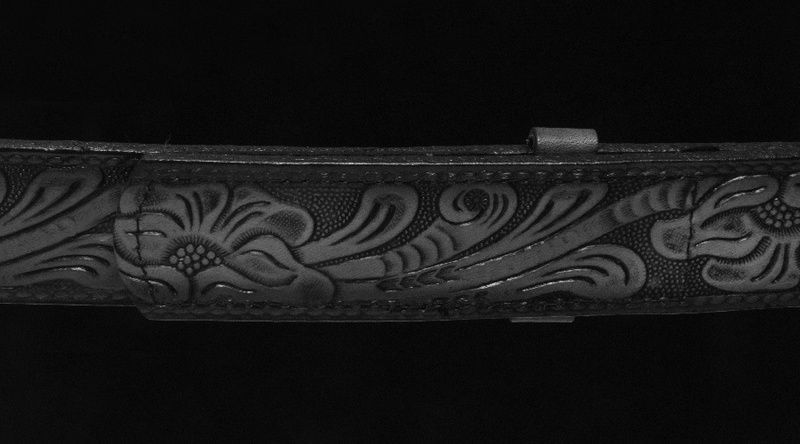 This American made beauty is intricate with a traditional floral pattern. 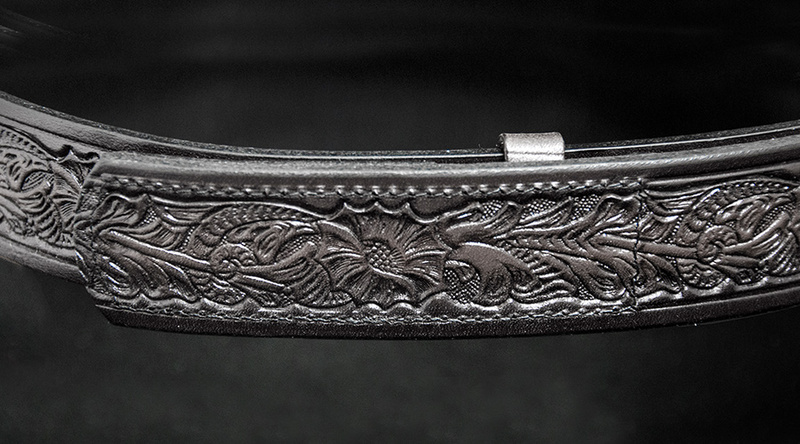 The buckle-less design is innovative, and will never scratch the back of your guitar, banjo, or bass. It comes in three colors, and is made of high quality leather. A handsome western belt designed exclusively for musicians. Rugged and stage ready, this belt is pure leather artistry. It will give you a great fit, and it’s buckle-less design will never scratch the back of your instruments. American made. When it comes to musician apparel, nothing is more important than wearing something that protects both you and your instrument. While some musicians might consider buckle rash and belt marks the sign of a well-played guitar, or scars of "character" on their instruments, others may be looking for a solution. Want your guitar to hold its value? Avoid those marks and scratches! Keep your instrument flawless and preserve its finish with a buckleless belt! Our unique belts have no exposed buckles, keeping your guitar, banjo, or other instrument out of harm's way from unsightly scratches. Not only will you get a really cool belt, we will provide you with a quality product made out of thick cowhide that contains no synthetic components. 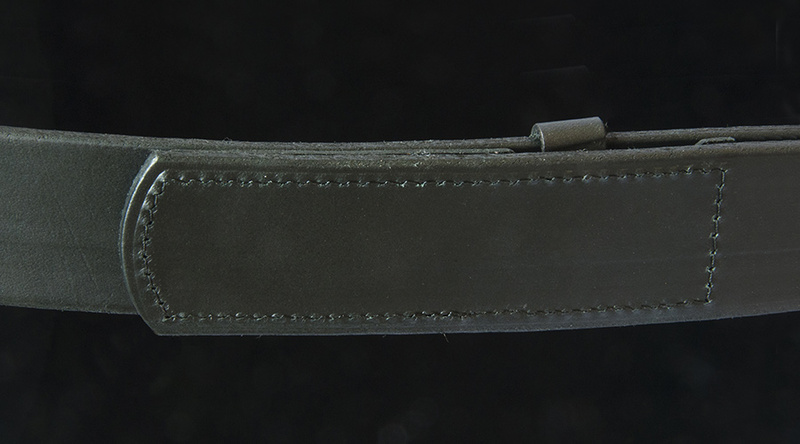 Each no scratch belt is hand-made and held securely in place with two metal prongs hidden on the back. Feel freer than ever to flail about the stage without worry of damaging your instrument. These belts are truly the best for musicians who are too busy making great music to worry about buckles, bruises, and abrasions! Choose from several leather belt designs in an assortment of colors - from plain to intricate. All of our belts are made in the USA. Since 2000, Musicians Belts have been handmade with pride in Bryson City, North Carolina. Our limited lifetime warranty covers any hardware failures or stitching issues as long as you own the belt. Musicians Belts offers free shipping on orders over $50. Applies to US orders only.